Model kits have an unusual connection with toy collectors. Usually, they are bypassed and forgotten by toy collectors, as most do not have the skill to build the kits leaving some great subjects that have been represented in sprue sadly left behind and under represented. 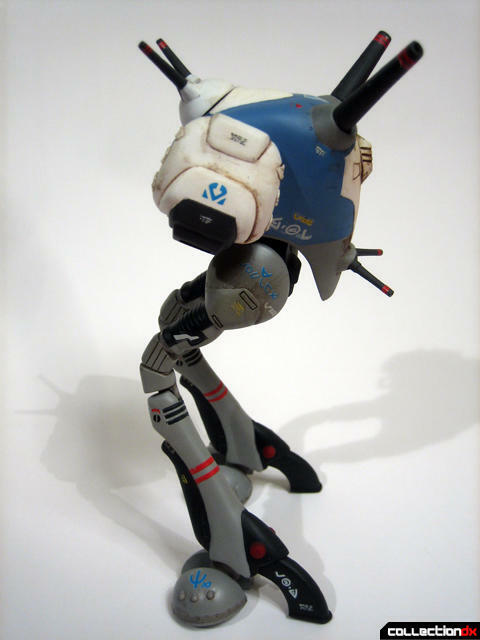 Arii’s 1980’s Macross line is a perfect example. Some great subjects were injected into plastic model kits but because many of the kits in the line that were produced were less than satisfactory the entire line has had a bad reputation over the years, even though there are few well done gems in the line. 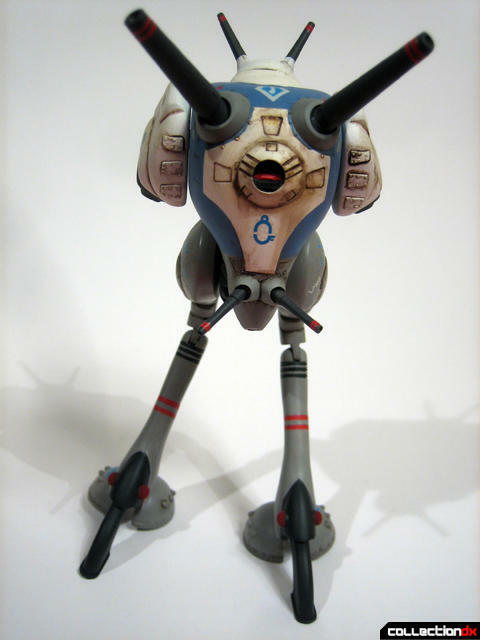 Arii’s 1/100 scale Regult Battle Pod from the Super Dimensional Fortress Macross TV Series is a great example. Manufactured and designed in 1982 this kit is one of the better kits from the line that builds up to a great representation of our favorite two-legged cannon fodder monster, although not without some minor faults. Arii’s Regult kit includes: 2x off white sprue, 1x black rubber polycaps, 1x instruction, 1x promotional flyer, 1x sheet of decals, 1x Glue. No options are supplied. The skill level is moderate to advanced due to the fragility of the legs and paint masking. 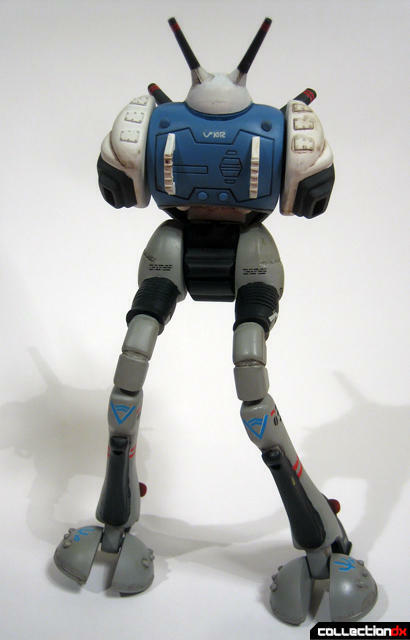 According to Macross World this kit is a rare kit due to some quality issues with the upper leg joints. I picked up this kit about 7 years ago at an antique store in New Mexico for $14.00. I just happen to luck out when I saw it at a vendor booth with an “all items 50% off“ sign. This was good as the original $28.00 asking price was a bit overpriced. Today, expect to pay from $8.00 to $18.00 for these kits. As with many of the early 1980’s Macross oil painted toy and model kit box art, this Regult box art is fantastic and first rate and really captures the spirit, realism and mystery of what I love about Macross to this day. The downside, and typical of the era, is that the model kit itself is not represented on the box top or sides, but in this case you are getting a decent kit. The kit itself is a straightforward build, but there are some things you should be aware of. I was surprised to see so much flash on this kit but considering that these Macross kits out produced even the landmark Gundam 0079 from three years earlier shows the popularity of these kits and I am sure that the molds were run down. Some parts clean up are necessary for the parts to fit correctly, especially the rear facing cannons array on the top of the Regult. Great care is needed when building up the upper leg area. Very much if you accidently drop even one tiny drop of glue in the wrong area forget it, it’s over. Make sure all the seams are filled properly before gluing those upper leg parts together. But if you take your time you should have no problem. 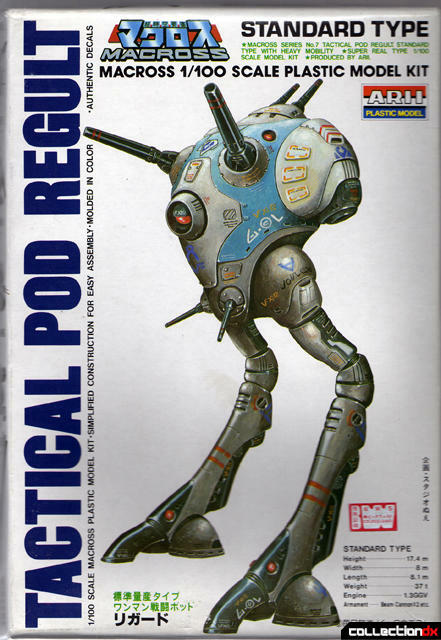 I have read that the upper legs were redesigned in Arii’s later Regult kits, but as I do not own any of these later kits, I cannot comment on how they were redesigned. Also the designers of these kits were more focused on playability of the kit after it is finished. They designed it so moveable joint parts are permanently joined together and cannot be taken apart. Since this kit was for display only I opted to leave those parts off for ease of painting at a later stage. Keep in mind this does not affect the pose ability of the kit after one is finished with the kit. The six-gun cannons present a few problems, the major one being that two larger cannons are a bit awkward and thick for the scale, as the cannon barrel holes should be filed down to look more scaled. If you have the skill, new cannons could be lathed out of aluminum for a better look. The heels were also open so I boxed them so they can look solid. You might want to box in the toes as well which was something I was planning to do but I thought I did not have the right resources. It was not until I was nearly finished when I realized I did have the right book with the proper info. I will build up these details on the next Regult I build. The body is three parts, the front, back and the bottom cap. I purposely left the bottom cap off until final assembly so I can put all the cannon parts in after I was through painting and decaling. My biggest complaint is how the jet nozzles are designed to be assembled together. Instead of having a bottom and top half the parts are split down the middle leaving a near impossible seam to fill. Filling the deep seam not only destroys the detail around it, but also destroys the shape of the nozzle in general and demands a lot of reshaping for the part to look right. Painting this kit is where one needs to deliver, as all the painting details are no joke and quite intricate. 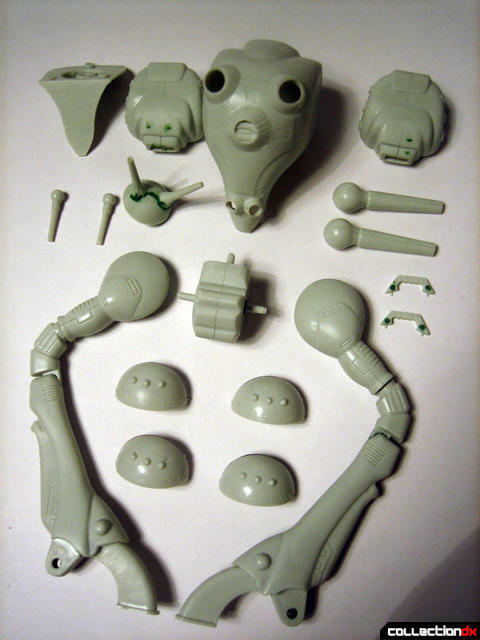 This is not like your current Systeminjection multi-color sprue Bandai kit, this kit is molded in one color, off white and every detail needs to be masked and painted. I painted the kit with Tamiya and other than the light blue, which needed to be mixed, all the other colors were straight out of the bottle. Honestly, give yourself about a week to paint this little monster as there are so many small details involved and they just don’t paint themselves! I sprayed a Testor’s gloss coat and applied the decals. I accidently dropped the entire sheet into water bowl so I had a limited time to quickly apply all the decals. Of what I can see the decals went on well but typical of the Arii decals, the instructions only tell you where to about six of the 25 decals provided. Thankfully Macross World saved me again and I was able to use their resources to place the other decals on the kit. After a spraying a Testor’s flat coat, I applied a mix of black and burnt sienna oil paints for the weathering and finished it off with a silver color pencil to represent chips in the paint. My other main issue with this kit is the scale. Since we here at CollectionDX already discussed scaling issues with some of the Macross vehicles here, there is no need to open a sore wound. But I am going to say its too small especially if you compare it to Imai’s 1/100 scale of Captain Kamujin Zentradi Armored Space suit, which I feel, is scaled correctly. 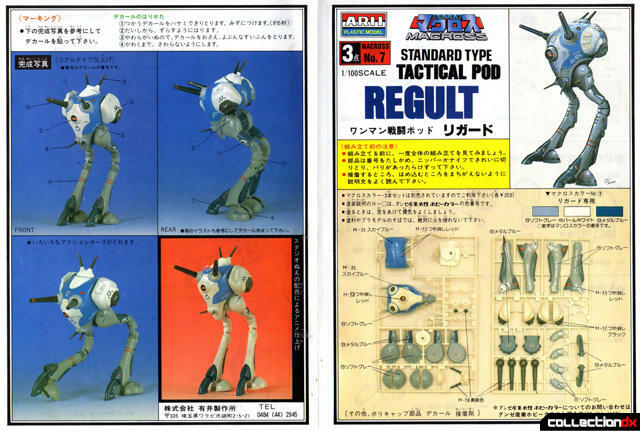 I know the pilot has a snug fit in the Regult but there is no way the Kamujin kit would fit inside this Regult kit or fit through the hatch in the back. Also viewing the kit from the back, the Regult body looks squashed especially compared to Revoltech’s Regult. Besides the jet nozzles parts and some scaling issues this kit builds up into an impressive model kit and stands out from the shelf amongst my other Macross toys and models. The best part about this kit is that it is one of the few representations of the Regult in any form and accordingly it is great to have an item few people have in their collections to display. The pose ability of the kit is quite good, with upper leg and waist pivot and bendable knees and toes and positional jet nozzles. Again I suggest this kit to moderate to advanced builders due to the paint masking and upper leg fragility but if you take your time with the finish and parts you will be rewarded with a beautiful representation of a classic Macross vehicle. ©2009 Article and pictures Leonardo Flores and CollectionDX. F-ing Awesome Leaonardo! 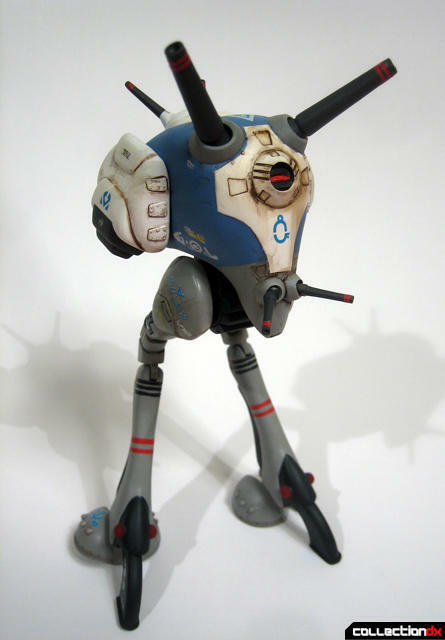 I only hope that when and if Toynami releases the 1/100 Battlepod that they have been working on since forever, it will be as nicely detailed as yours! Kudo's dude. Awesome! Great review and build of a kit that I did not realize was so cool. You did an excellent job of cleaning the kit up, and the weathered paint work looks slick. Wow Leo, you are such a talented kit builder. I am jealous. Great job! One thing I like about the Arii and Imai kits of the 80s is their exquisite boxes especially the white ones. 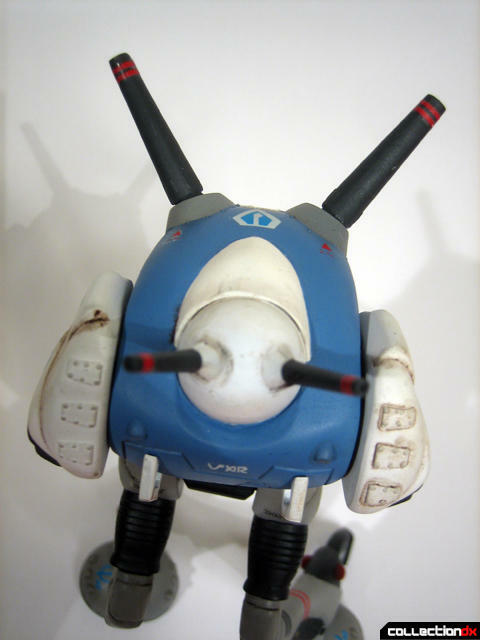 Personally, I had almost all the Macross Arii and Imai collection but when I saw that there were hundreds of models in the Macross line, I decided to stop and sold many of them including the 1/72 Tactical Pod Regult and Glaug. Looking back I feel sorry I took that step. Fast forward to today. The 1/100 Arii kit Leonardo built is wonderful but remember to use Tamiya (grey) putty or Mori Mori (yellow) next time round as they are far superior to green putty which I find hard to cover with primer. Although it is a very good model, I think it has been surpassed by Kaiyodo's Revoltech offering. 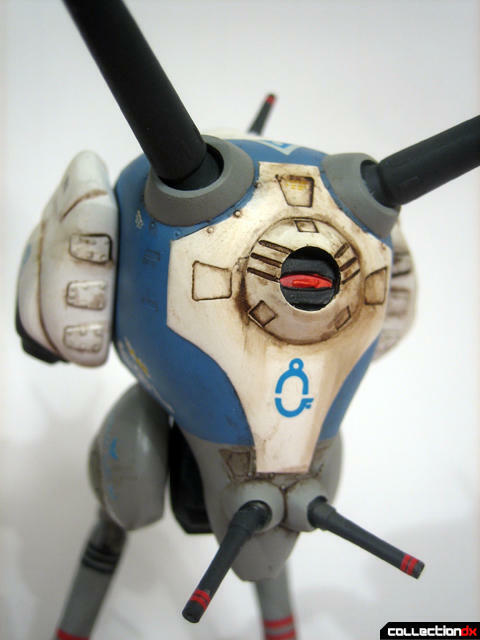 I hope Yamato will make one in their GN-U Dou series. Very good article throughout. Thanks for sharing. Thanks everyone for the great comments. Its taken me many years to get to this point and I still have a way to go to where I want to be but in the last three years I've been finally putting out some great models that I'm very proud of and your comments are appreciated. Hands down those early Arii, Imai and Nichmo Macross packaging are the best ever! 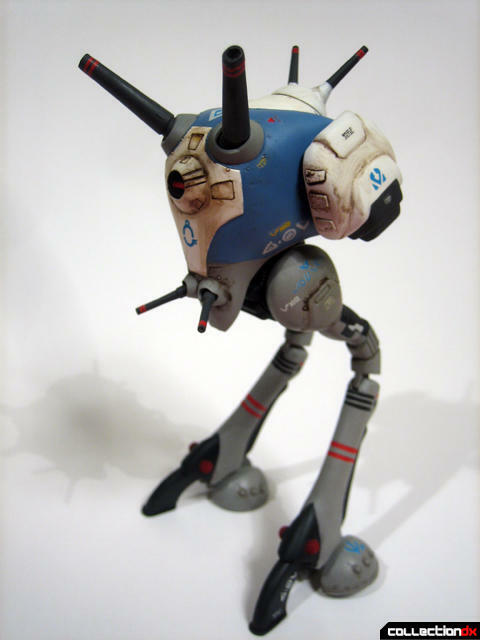 Much agreed about the Revoltech Regult figure, I really need to pick that up soon! Leonardo,you are like the king of model painting. It looks like the real thing! The box art is the thing with these kits. Amazing stuff. These vintage kits are really nice, and fun to collect. I remember finding these in the strangest places, like at a gift shop in Mrytle Beach. What I can't believe is that you can get these for less than they cost in the 80's. Yeah,I've never looked into vintage kits,and when he said "$8-$18" I did a double take! I wonder why they don't hold value? Thanks Kidnicky for the great compliment! Here's what I think: so many of these kits were made back in the day that the collectors who want them already have them. I'm sure they are even cheaper at hobby swap meets in Japan. There are some expensive and rare ones but the bulk of these standard early kits are quite inexpensive which is great for me as I now have a second chance at building kits I missed as a kid. And if one doesn't build kits the beautiful box art is worth the price of admission alone! I really like the attention to detail you put into this thing. Getting all those stripes, dots, and weathering really must be a test of patience when you bring it to life. It really makes a piece like this all the more special, especially when you mirror the grit from the box art into the actual piece. I haven't really gone all out on model kits, so it does have my amateur self awe stricken. Speaking of the box art, that stuff really does take me back. There's just something about the art style of that kind of box art that drew me in when I was a kid. It made the mecha all the more awesome and, as you said, mystifying. The nostalgia in me burns. 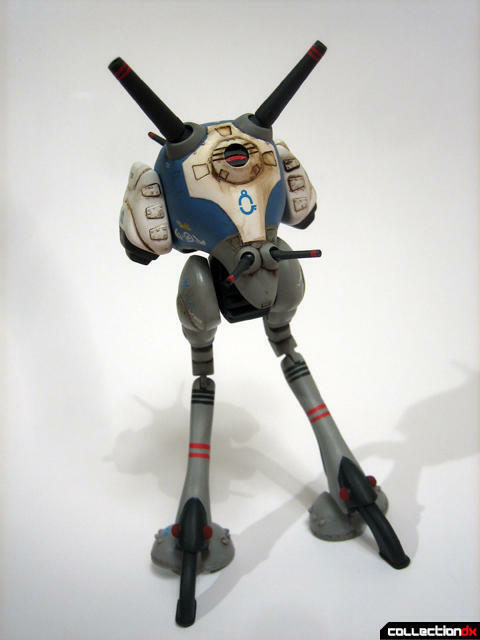 Nowadays people can go out and buy a Revoltech Regult. 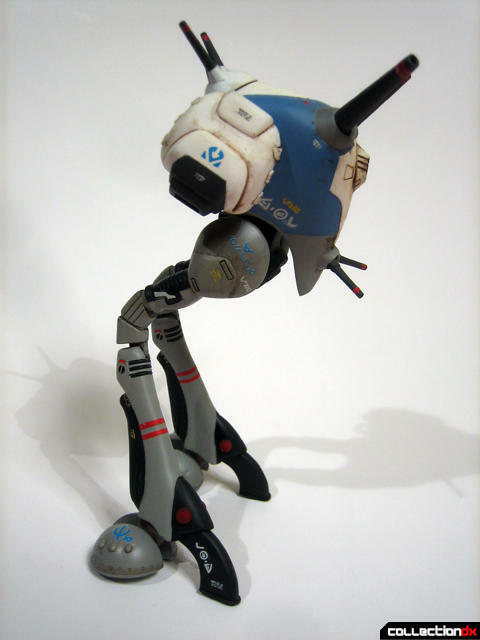 Even though they could probably take that thing into the tub with them (I like recreating key scenes from SDF Macross with my rubber duck squadron), this completed model kit is truly a piece of art. It speaks of the appreciation for the source material and then some. I will tell you this was not an easy kit to paint, there is a lot masking involved with this Regult and I would say 90% was masked and painted with an airbrush. Yes these kits might be inexpensive but if a lot of time is spent building, a gem of a kit comes out in the other side. Thanks for noticing those details. I'm looking forward to locating the other three Arii Regult kits and building them for CDX! Makes me wonder what ever happen to these oil paints from these boxes because they absolute great works of art, especially the Nichmo kits. All that art design effort for what is essentially a 200yen kit. I admire that kind of effort! Thanks again, My Hasegawa 1/72 VF-1S DYRL review should be up shortly and I will tell you now that it is one of the best finishes I have ever done!